Retail audits are an essential part of any CPG (Consumer Packaged Goods) business. They help implement successful retail strategies that help increase sales and boost profits. • Cross-platform app (BYOD - bring your own device), so your reps will be able to use their own cell phones. • Visit planning and scheduling: This way, not only will you be able to plan when your reps will visit each store, but also which tasks will they perform while at the point-of-sale. • Customization: So you can create your own, custom POS audit and inspection mobile forms requesting photos, signatures, etc. • Works online/offline: In order to enable your reps to perform retail audits even if they are in areas without Wi-Fi and/or wireless Internet. • Real-time reporting: This will allow you to virtually be at the point-of-sale with your reps and instantly react to any critical information, such as out-of-stocks. Take advantage of free trials, "lite" and pay-per-user versions of retail audit software to implement a store audit plan on a limited territory, for a limited number of products, and/or only with a few reps. Increase the scope of your retail audits as you tweak your processes and become more familiar with the software. Constant monitoring is a key factor in the successful implementation of a retail audit plan. This is why an effective retail audit software will allow you to view in real time the audit results coming from your points-of-sale. It should also allow you to analyze results and automatically generate "readable" reports that can be printed, saved to PDF and shared. 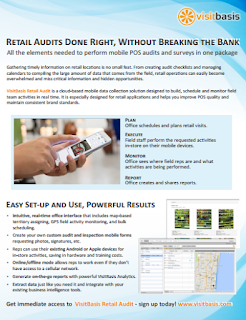 VisitBasis is a complete retail audit solution that offers all the elements needed to perform mobile POS audits and surveys in one package. Learn more at www.visitbasis.com. VisitBasis Retail Audit is available at Google Play and App Store and can be downloaded for free for an unlimited number of users!